This spring has been about puppies. We lost our 16 yr old dog about a year ago. A German shepherd that disliked men and was very protective of women. He was chicken-brained in his later years due to strokes, blindness and arthritis. But the hair! Shedding and all the clean up that goes with it…..
My daughter and I decided that we both wanted a large dog—smart, good with kids and older folks, and most importantly no shedding. 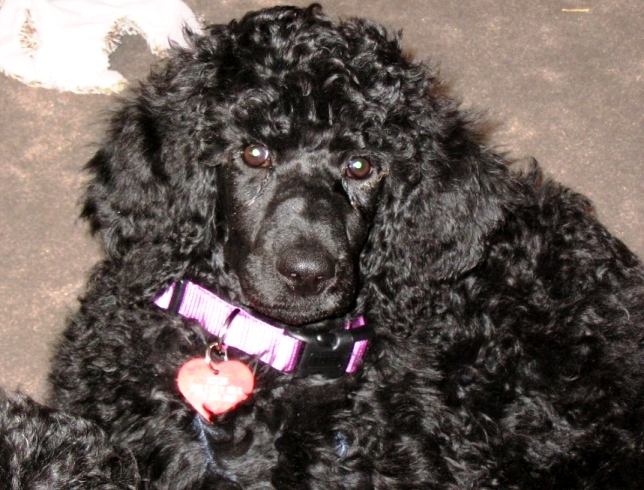 The answer was a standard poodle. We overcame the initial objections of the men-folk in our lives by choosing a breeder in Montana that uses the dogs for carting, hunting and companioning outdoor sports. We scoffed at the pictures of the show cuts and the pretty pink bows. In the end, we planted our feed and stood our ground. The dogs, one male and one female (litter-mates)born on Halloween 2010 arrived in February. We did not separate them to begin with. My daughter—bless her!—kept both until they completed potty training. We took the kids to puppy classes and learned more about our breed. The men-folk (most at-least) came around. We got the girl permanently. Both puppies are a true joy! If you know the breeds, you know that shepherds are very vocal—noisy even. Poodles are very quiet. No doubt these traits are grounded in their original purpose—for shepherds to herd animals, keep predators away and for poodles to hunt, or point to the prey for the hunter. It was unnerving at first. We put tags on her so that she would jingle when she walked or moved around so we could tell where she was. That is when I noticed the springing. Yes, I said springing! She has a spring in her step that is charming and fun to watch. She springs into the air and does a 360 rotation when she is play fighting with her brother. She waits patiently while I fill the food bowl and then springs into action when I give the release command. She plays fetch with herself by letting the tennis ball roll off the steps into the yard and then springs after it to grab it and go again. Last time my husband mowed, she was pretending to square-off with the mower, springing this way and that in order to intimidate the machine. That’s the enthusiasm I want and really only have at times. I want to spring into action, obviously relishing the task, playing with the ideas and ready to do a 360 rotation if need be. When I do that, I am happier, more engaged in whatever the activity is and dare I say it—more successful in the outcome. It’s that relaxed confidence that this is going to be great!—whatever it is—that gives us the spring. So, I’m giving myself the release command to train myself into that springing everyday. Interestingly enough the actual command is “Relax!”.